Thanks Paul - Our Champ, Rekindled will not be contesting the Melbourne Cup this year. I have no idea why as there are no other races suitable in Australia. All I can think of is stud duties. I like the look of Cross Counter here. His performance at Goodwood was outstanding, and then at York he was given a nice little prep to finish 2nd in the Great Voltigeur - the kind of race that will raise his profile and get him into the Cup, but without penalising him with further weight. I like Latrobe, going the same route as Rekindling. Think he has a big chance in the Leger, just hope he has enough tactical speed for the Melbourne Cup. Lancaster Bomber is an interesting entrant, always thought he'd appreciate a longer trip, but 1m to 2m is a bit severe! What happened? There has been no news here in Oz. in several level weight G1s up here from 1m6 to 2m4. An article about Tony Bloom's (Brighton Owner) horse that is an early favorite for the Melbourne Cup. I think he should have gone with an Aussie jockey but I think De Sousa rides in Hong Kong so he should be ok.
Caulfield is way to tight for Mohar - settled last then hooked wide and ran on for 4th - Benbatl was 1st, Blair House 2nd, Humidor 3rd. 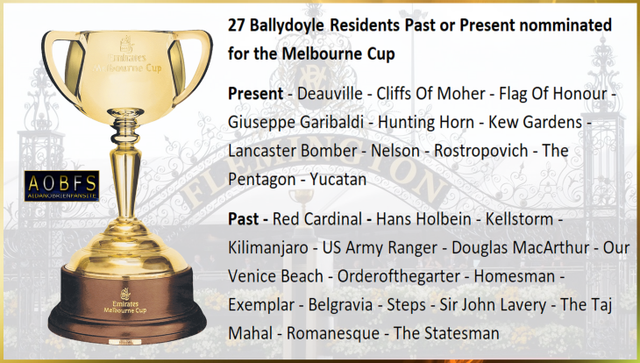 Looking good for the Melbourne Cup if distance and weight isn't a problem. Last edited by NPG319 on Sat Oct 13, 2018 10:57 am, edited 1 time in total. Yucatan just brained them in the Herbert Power 2400m/12f.